With those young gadabouts Mumford & Sons taking the Americas by storm, and subsequently giving traditional folk music a healthy kick in the pants, bands like Police Dog Hogan are now allowed to break free from the shackles imposed by the traditional English folk mafia and be a lot more adventurous with their output. “Thunderheads” tells a sad tale of a foundling, but there’s no navel gazing nor self-pity on this charming song about self-belief and positivity that ebbs and flows like a stormy sea. Police Dog Hogan skip back and forth between English and American folk with ease and a smile on their faces. “The Land of Miracles” uses a Celtic military beat as the backing for a well-spun yarn about the formative years of the oil fields of the South (I think). On “Judgement Day”, we get a drinking song straight from the Blue Ridge Mountains, chock full of jug-band harmonies. “A Man Needs a Shed” and the rollicking “West Country Boy”, with their acutely observed lyrics and jaunty tunes, couldn’t be anything other than English in origin; but the sentiments will resonate with men and musicians across the globe. At the beginning, I mentioned that the band was being adventurous, and that comes to the fore on “Home” — not only a potent song but a collaboration with a group of ex-prisoners called Platform 7 about returning home when the prison sentence ends. The violin playing and harmonies will bring a tear to a glass eye. Halfway through, we get a quite-unexpected “rap.” It may not be of Snoop Dogg’s standard, but you never got that sort of thing from the Incredible String Band. Without a shadow of a doubt, my favourite track is another break-up song, “One Size Fits All”. The banjo and accordion here are exceptional, and when James Studholme sings, “When it comes to heartache/One size fits all”, I can’t stop myself singing along. 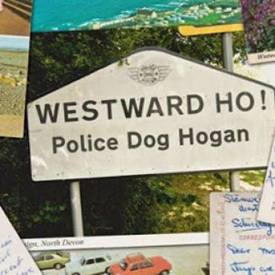 Police Dog Hogan certainly aren’t a boy band, and this venture hasn’t ever been meant to be a means of making them millionaires; but that doesn’t stop them being professional and producing an album that will appeal to fans of all ages and genres.